I have 7+ years of experience in SEO; also 500+ Positive reviews on SEOClerks. More than 1000+ orders Successfully Completed here. 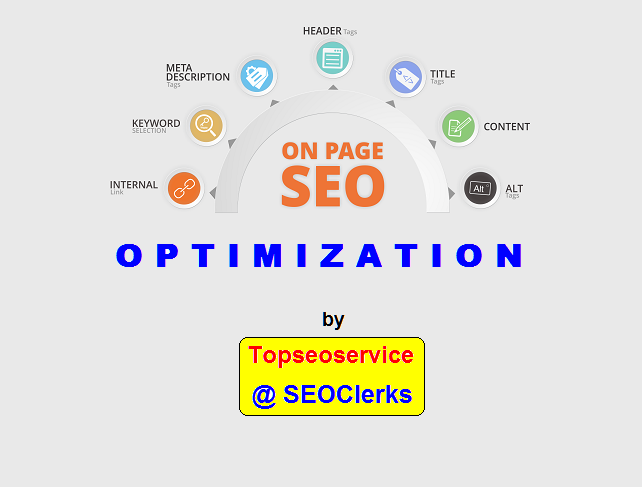 Now you are viewing the Highest Rated On Page SEO Optimization service in SEOClerks. Looking for a SEO service which is Google Panda, Penguin, Hummingbird, Fred update safe? Actually no off page service can be Google algorithm proof. However On Page SEO is always Google update proof. A properly optimized website can rank on Google much easier compared to a normal website. On Page SEO factors are the base of any website. And if base is strong, your website can rank for the most competitive keywords out there. Still most webmasters ignore On Page SEO, as a result Google ignore those websites! No link building techniques can rank your website, unless you have a properly optimized website. Therefore no more ignoring the most basic SEO technique. Let get started with On Page SEO optimization with your website. Onpage SEO factors are very important for Better ranking in search engines including Google. If your website is not properly optimized for these on page SEO factors, it will not rank for your desired keywords. On the other hand if your website On page issues are properly optimized. It will be much easier to rank keywords. * Page Title: Title is the most important on page SEO factor. I will write optimized title for your website focusing on your primary keyword. * META Description: I will write Google friendly meta description that will increase your CTR from search result page. Because of that you will get more traffic from Google and other search engines. * W3C Validation report: You will get an exclusive report for your website. * Canonical Fixing: If you have canonical issue, it can be hard to rank for desired keywords. I will fix the canonical issue if you have. * IMG naming and Alt tag optimization: Image naming and alt tag plays an important role. I will do the both. * SEO Friendly URL Optimization: URL is another important on page SEO factor. I will make your URL SEO friendly. (work if you have more than 1 page website). * LSI Content Optimization: I will check the keyword density of your website and adjust your website content for best result. I will Analyze, Fix and Optimize your homepage with this basic package. If you need more pages to be optimized; include Extra while order. *Contact me for Custom order, if you have more than 20 pages in your website. Optimize OnPage SEO Factors for Better Ranking is ranked 5 out of 5. Based on 30 user reviews.